A stationary electric charge, e.g. an electron or a proton creates around it an electric field. Although individual magnetic charges (called magnetic monopoles) are predicted by certain theories, their existence has not been confirmed. Electrons have an intrinsic magnetic field around them. In some materials, the magnetic fields around the materials add together to give a net magnetic field around the material. This is the case of the magnets. In other materials, these fields cancel out and the material does not have a magnetic field around it. A charge that is moving is creating around it a magnetic field. Using the image of the Road Runner Bip Bip below on the left, we can imagine a moving electron creating a disturbance or turbulence which represents the magnetic field. Imagine a wire conducting an electric current as shown in the image above on the right. The electric current is represented by moving electrons. These will create a magnetic field and as a result a wire which is run by electric current will create a magnetic field around it. This was discovered by Oersted who showed that a compass is deflected by a wire that is run by electric current. Let us imagine that you move a magnet towards this frame. You will notice that when you are moving it and as long as the motion lasts there is an electric current being induced in the frame. This is the phenomenon of electromagnetic induction that was discovered by Faraday. A magnet is surrounded by a magnetic field which can be visualized by the magnetic field lines. 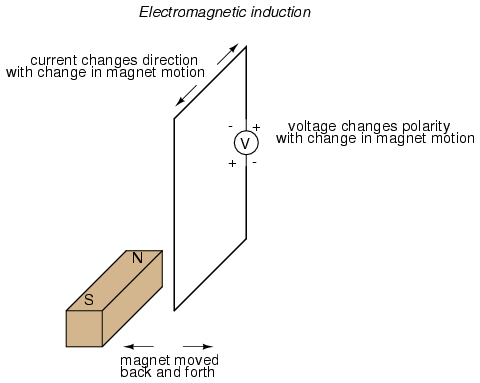 It is the change in the magnetic flux (which can be apprehended by the magnetic field lines change) which causes the induction of electric current. A changing electric field is creating a magnetic field. A changing magnetic field is creating a changing electric field. It was mentioned that a charge that is moving is creating around it a magnetic field. If its velocity is stable the magnetic field will be stable. However, if its velocity is changing e.g. is increasing, meaning that the charge is accelerating, then the magnetic field will be changing. A changing magnetic field creates a changing electrical field and vice versa. In other words, an electromagnetic wave is generated. Let us go back to the mechanical waves and the green beads on the string. An electron that is moving up and down, in other words which is oscillating, in a wire such as in an antenna, would be having a velocity that increases, decreases, becomes zero and then is reversed and increases, decreases, becomes zero etc. Its energy goes through similar changes and also this changing movement is associated to a changing electric field and a changing magnetic field which increase, decrease are reversed etc. Also, this energy leaves the charge and is propagated in space. For instance away from an antenna. This is the principle of the generation and the propagation of the electromagnetic wave. In the image below we see the electric and the magnetic field forming an angle of 90 degrees. In practice how can we generate an electromagnetic wave? We would need charged particles like electrons who run back and forth, so that there is a changing electric field and a changing magnetic field. There is a specific circuit that we can use, the LC circuit for this purpose. Let us first consider the RL circuit. The RL circuit includes a resistor and an inductor. What is an inductor? If we consider a piece of wire and we use a pencil to roll a part a lot of times around it then we will have an inductor. We know that a wire that is run by electricity creates an electric field around it that has the form shown in the picture below on the left. If we roll the wire to create an inductor we will have a more complicated electric field form. If we start applying a current, the increase from zero to x will represent a changing electric current and therefore changing magnetic lines or magnetic flux in the complicated wiring setting of the inductor. The inductor will tend to resist to the increase of the current. As a result the voltage at the resistor will lag until it reaches a final value. But once it reaches it, the magnetic lines or flux will be stable and the inductor will not alter the behavior of the circuit. The RC circuit includes a capacitor and a resistor. If we connect these elements with a battery to create a closed circuit what will happen? Electrons from the battery will flow and they will assemble on one plate of the capacitor. The presence of dielectric between the two plates does not allow them to flow inside the capacitor. A difference in charge will be progressively be built between the two plates. The potential between the two plates will increase. We say that the capacitor is being charged. As more charges are being accumulated on the plate they repel the ones that keep coming. As a result it is becoming more and more difficult for the voltage to increase. In practice, the voltage will increase but the increasing difficulty will be reflected in a smaller and smaller rate of increase. This would be mathematically described with the logarithmic growth model function.